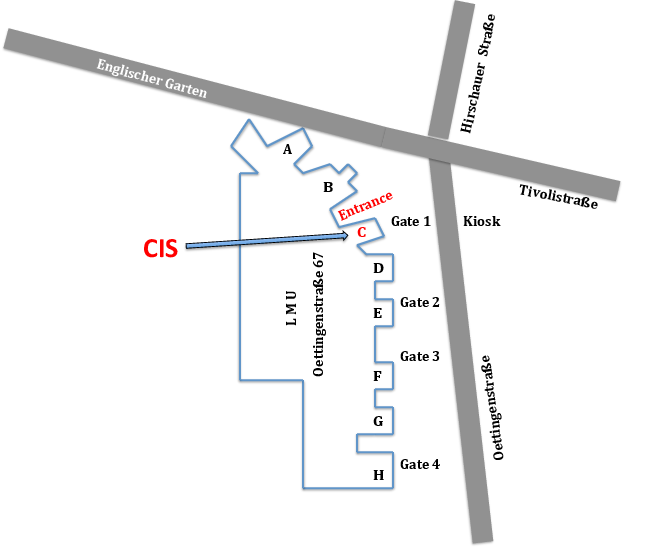 Walk up the stairs to the entrance between Wing C and the green glass building (marked "entrance" on the map). Behind two sets of glass doors, you will find the entrance hall. Walk through another glass door at the back left corner of the hall. Take the stairs (on the left) up one level. Turn right and right again and you will see the "CIS" sign. Take any S-Bahn (suburban train) leaving the airport and get off at Isartor (most trains stop at Isartor, change at Ostbahnhof or Hauptbahnhof if yours doesn't). Then take Tram 16 to Effnerplatz and get off at Tivolistr, the 6th stop after Isartor.